National Party Leader John Key has met with representatives of the KidsCan organisation today in a bid to expand and implement National’s Food In Schools programme. He is responding to the offer today by James Crisp Limited, to provide KidsCan with boxes of Cinderella raisins for distribution at low decile schools. It follows last week’s donation to KidsCan by Tasti foods. National will now be putting business donors in contact with established not-for profit providers after Labour Ministers attacked Food In Schools as ‘Tory charity’. Mr Key says for that reason he will keep confidential any direct requests from schools for assistance. 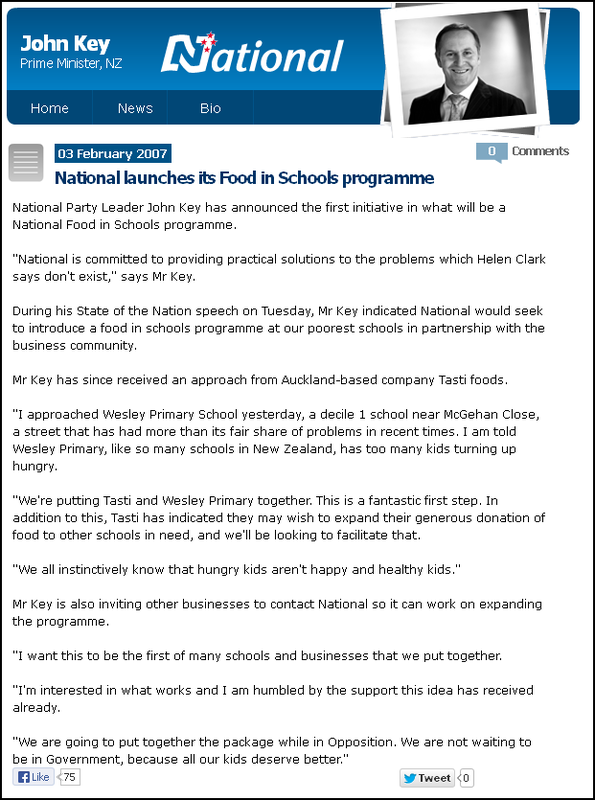 National Party Leader John Key has announced the first initiative in what will be a National Food in Schools programme. “National is committed to providing practical solutions to the problems which Helen Clark says don’t exist,” says Mr Key. 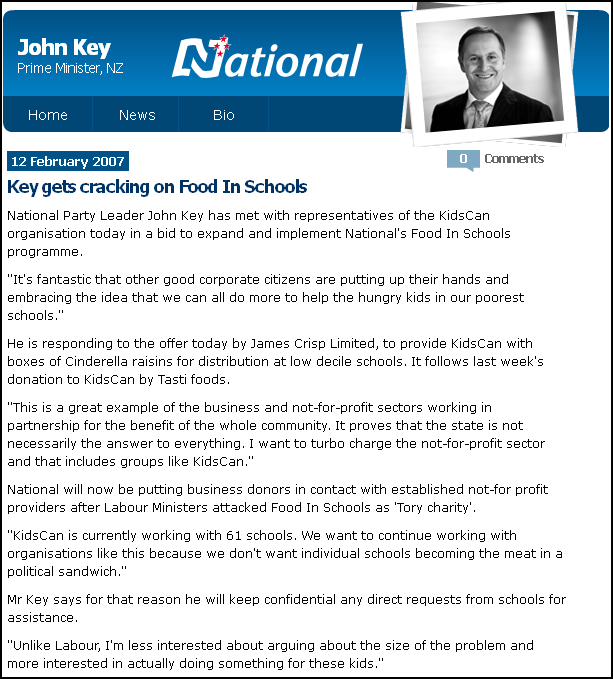 During his State of the Nation speech on Tuesday, Mr Key indicated National would seek to introduce a food in schools programme at our poorest schools in partnership with the business community. Mr Key has since received an approach from Auckland-based company Tasti foods. “I approached Wesley Primary School yesterday, a decile 1 school near McGehan Close, a street that has had more than its fair share of problems in recent times. I am told Wesley Primary, like so many schools in New Zealand, has too many kids turning up hungry. “We’re putting Tasti and Wesley Primary together. This is a fantastic first step. In addition to this, Tasti has indicated they may wish to expand their generous donation of food to other schools in need, and we’ll be looking to facilitate that. Mr Key is also inviting other businesses to contact National so it can work on expanding the programme. “I want this to be the first of many schools and businesses that we put together. “I’m interested in what works and I am humbled by the support this idea has received already. “Is it really beyond us as a country to ensure that every kid turns up to primary school with some food in their stomach? I don’t think so. Hunger and malnutrition are simply unacceptable in a developed country like New Zealand. And it’s a fact that kids can’t and don’t learn if they are constantly hungry. Their brains don’t develop properly and they can’t stay focused in the classroom. An empty stomach and an empty lunchbox set kids up for an empty life. Obviously it’s a parent’s responsibility to feed their children. What more fundamental parenting role could there be? But that is not what is happening in some parts of the country. Unless we tackle this problem we are effectively punishing children for the sins of their parents. Currently, some schools dip into their operational budgets to provide a few Vegemite sandwiches for those who miss out. That is not good enough. I believe this is an area where government can work alongside the business community to find new and innovative solutions to a deepening social problem.